We had just finished Easter lunupper (brunch sounds so nice…what do you call it between lunch and supper? Lunupper?). We rolled into the house and had a message. The caller reported a swarm of bees near a popular chain restaurant attached to the big mall in the city. The swarm was at the top of a cedar tree and was “the biggest swarm ever seen” by the manager of the restaurant. I was pretty skeptical about the size as most people have never seen a swarm of bees so big could mean anything. Still, I decided to roll down with Abigail and my father-in-law to find out. As soon as we pulled in, a crowd gathered and watched us do our normal routine of surveying the swarm. It wasn’t the biggest swarm I had ever seen but the manager had picked out the fact that it was a big swarm. It was in the very top of a cedar tree. Cedar trees are sort of flimsy at the top. Unlike an oak or maple, the cedar doesn’t really have big branches against which one can lean a ladder. It has been my foolish tendency to just go for it when it comes to swarms. I just threw the ladder up against the green of the tree and climbed my way up. I always carry loppers (is that a local term or what they are called? Long handled tree pruners, anyhow) to cut branches. The funny thing is that when you cut a swarm out of a tree, you need to hold onto the branch with the bees on it. Of course, it also takes two hands to run the loppers. I learned the first time I did this that I can hold onto the swarm with one hand and brace one handle of the pruners against my neck. I use my other hand to close the loppers and cut the branch. Now let me tell you, doing that leaning into the greenery at the top of this flimsy tree with a swarm of bees was interesting! So the crowd continued to watch as the three of us did our thing. We transferred the bees from the branch to the hive I brought along. I gave the branch a good shake and the bees mostly fell into the box, but some fell onto the sheet I had under the box (another lesson I learned…put down a sheet first. It looks more impressive and help me keep better track of the bees as they walk into the hive). In a few minutes, it was clear I had the queen as the bees on the sheet and from the tree ended up working their way right into the hive. 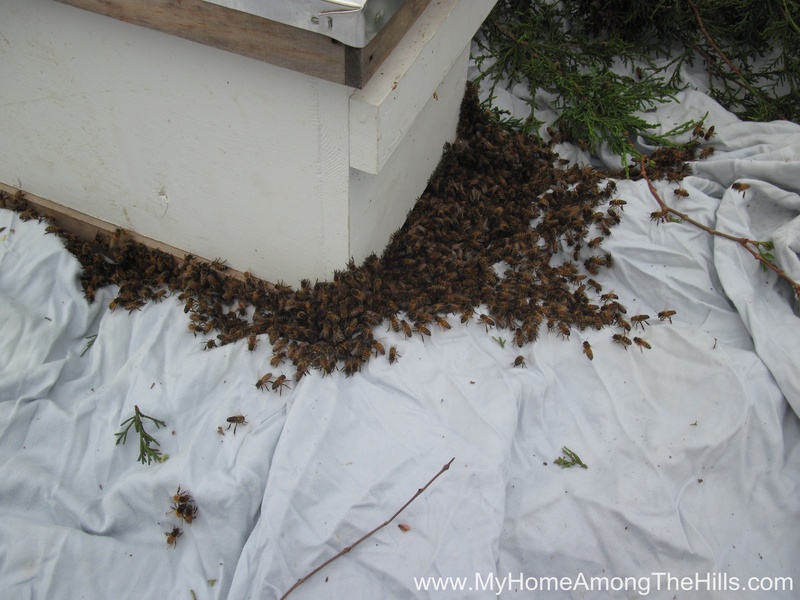 We packaged up the hive and hauled it off in the van (much to the dismay/excitement of our audience). I really like the “performer” part of catching swarms. 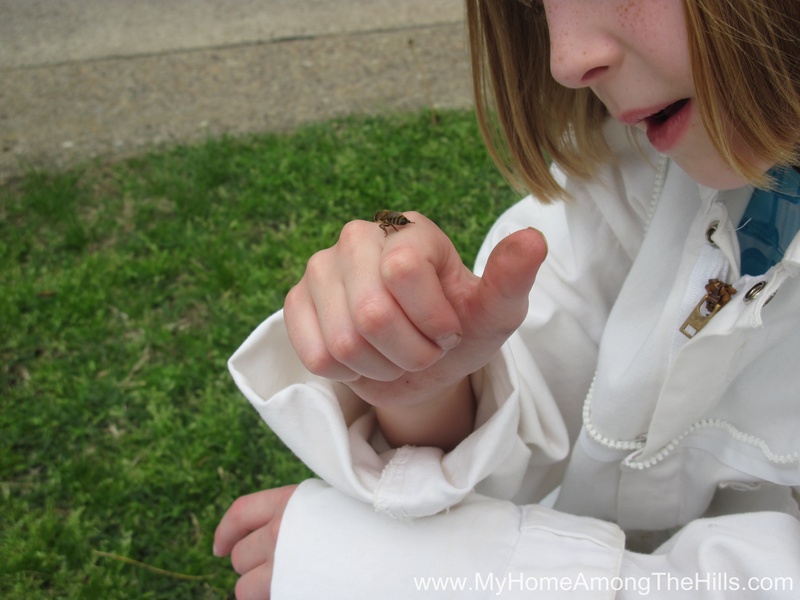 Hauling bees in the van is sort of the grand finale! The second striking thing was a man who walked up as we were doing our thing. It was clear he was drunk. He walked right up to us and began to talk to us far closer to the bees than I really liked but he was so curious about the whole deal. He ended up sitting right beside our area and asked all sorts of questions. He asked about the queen and I said she was bigger than the rest. He said, “Bees have three parts, right? The abdomen, thorax and head, right?” He must have sensed my surprise because, with a smile on his face, he added, “I may be homeless but I’m not stupid.” “No sir, you are not.” That brief conversation really turned my prejudice on its head. I shook his hand (which I think surprised him) and we parted ways. I think we both ended up with a pretty cool story to tell, though they are undoubtedly quite different. Here are some more of my bee adventures and here are pictures of many of the swarms I have captured. This is really cool, Warren! Kudos to Abigail for being fearless and helping you. 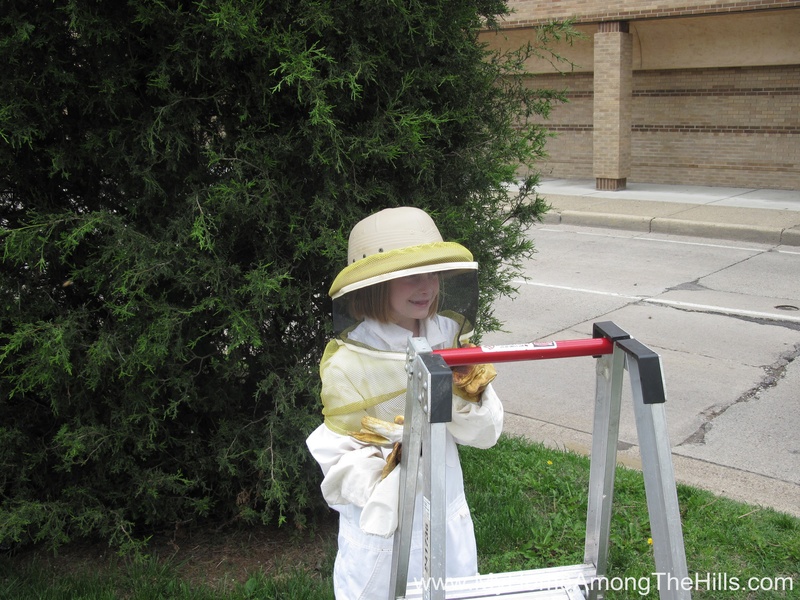 Our grandson helped Larry with our bees once and loved it. I’m going to share this on Facebook. It’s just too good. How wonderful! There are so many layers to this story, so “wonderful” was all I could think of. 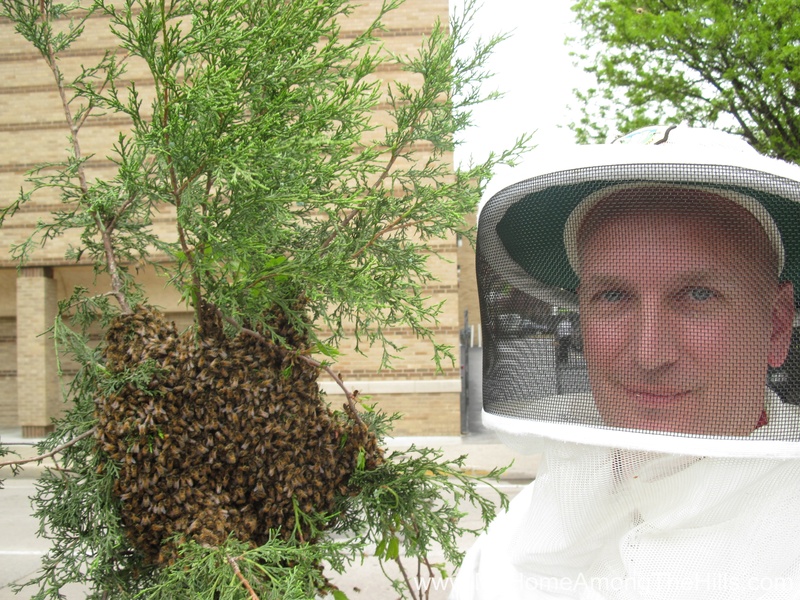 Warren, can bees in tree cavities be trapped? Ceecee – sure they can be trapped but it is hard. Mostly you have to give them a one way exit so they can’t get back in. Sometimes if you place a hive very close to the exit, the bees will congregate there. Eventually the queen will (hopefully) come out to look for her bees (which she knows are near…hopefully) and will join them in the new hive. This is how people sometimes get bees out of a house when they can’t just cut a bigger hole. It is pretty tough to plug up every entrance in a tree though and if they can get in another way, it won’t work. The other way is to cut the tree and get at them that way. Search for “bee gum” for details. Brings back a lot of good memories. Whenever I was on swarm detail with my parents, I also mentally thought of myself as sort of a Ghostbuster which was current back then. We roared up in our ‘Ectomobile’ donned our suits and set to work ‘Cleaning Up the Town’. May you get lots of honey from that hive. What an interesting capture you had! Abigail and the homeless man are characters in a little gem. You find the meaning in your experiences which is why I love reading your blog. I’m so proud of both you and Abigail. These are the experiences she’ll take with her throughout her life.